What Types Of Clearomizers Are There? In 2014 the various models, types and designs of clearomizer tanks is huge with over 250’ different main versions to choose from. From a new vaper’s point of view choosing the right type of clearomizer can seem mind boggling trying to decide what type of clearo tank is best suited to their vaping requirements, battery type and type of vape hit. Most basic clearomizers are disposable and will last around 2-4 weeks of average to heavy vaping. Some vapers have stated that that they can use a basic clearomizer for over 4-6 months without the need to change, however in our experience between 2-4 weeks is about the right amount of time for most people. Aftr this a basic clearomizer will start to produce signs of wear and tear like; burnt taste, hard to inhale through, reduced power performance. Example basic clearomizers; CE4’s and CE5’s. Mid ranged clearomizer usually pertain to the re-buildable selection of clearo tanks such as KangerTech T3S, Mini Pro Tanks, Kanger EVOD 2’s etc. These clearomizers will produce a fairly strong continuous hit until the time comes to replace the internal atomizer heads. Normally mid-ranged clearomizer will operate on a higher voltage anywhere between 3.4 to 4.8 volts allowing for more power, stronger throat hit and larger vapour production. High performance clearomizer usually pertain to clearo tanks that offer a large e liquid capacity and high voltage and high wattage compatibility. High performance clearomizers like the Aspire Nautilus, KangerTech Aerflow and the Innokin iClear XI for example will generally cost more than the basic and mid ranged ones but will will also last longer and offer a better quality of vape in terms of flavour consistency, vapour production and throat hit. 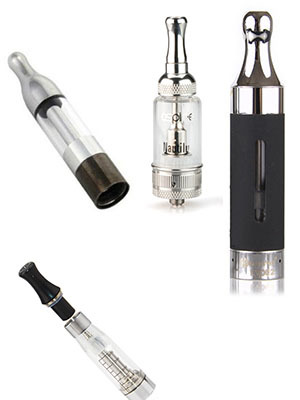 Rebuildable clearomizer are those that allow you to change the internal wick or atomizer head when they start to reduce in power. This re-buildable feature allows you to simply replace the wick or head without having to dispose of the whole unit. It also allows you to adjust the power through choosing various OHM powered heads such as 1.5, 1.8, 2.0, 2.4 and 2.8OHM’s. Rebuildable clearomizers like the KangerTech T3S, EVOD 2, Aspire CE5 or CE6 for example all allow to change the internal heads which will save you money in the long run as a new wick or atomizer head costs a lot less than a forking out for a new tank each time you need a new one. Self build clearo tanks are usually aimed at experienced vapers as they are more complicated to use than a traditional tank. However if you are into building your own wicks then a self-build clearomizer is for you and will allow you to make your own internal wick atomizer heads and determine your own OHM output for each one. A recent addition to the clearo tank market is the addition of air flow features on the clearo tanks that will allow you to adjust the amount of air intake you get when you draw on your tank. the airflow in your draw affects the type of hit you get and can transform a throaty hit into more of a lung hit. Air flow clearomizers like the KangerTech Aerflow and the Aspire Nautilus will produce a hefty vape that suits you best.